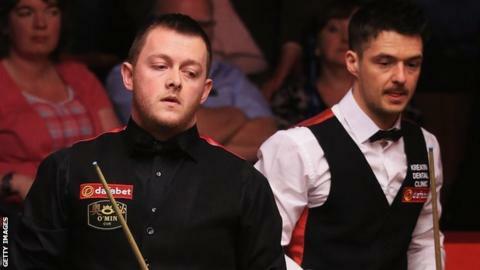 Mark Allen eased to a 10-4 win over Michael Holt in the World Championship at the Crucible despite suffering from illness and blurred vision. The Antrim player revealed he sought treatment for food poisoning in the lead-up to the match and had struggled to see his shots clearly. "At times I couldn't see the balls, I had blurred vision," said Allen. Allen led 5-4 after Tuesday's first session and won every frame in Wednesday night's second session. The former world semi-finalist will meet either world number one Neil Robertson or Robbie Williams in the second round at The Crucible Theatre. Allen, 28, will be in action again on Sunday morning and Sunday evening. Robertson leads Williams 7-2 after the first session of their match. Allen's highest break of 72 came in the very first frame of the match against the Englishman. The world number 14 went on to dominate the second session, compiling a break of 65 in the final frame to secure victory. Allen added: "I've got a few days to rest now - I've had a bit of food poisoning and haven't been feeling too good the last few days. "An hour and a half before the match I was in the NHS walk-in centre, trying to get treatment. "I wasn't able to see anything more than three feet away, it was a guess. Thankfully I managed to guess right on a few."